‘Melbourne Chinese Martial Arts Club’ principal instructor and author David Peterson demonstrates how to use one of Wing Chun’s lesser known defensive actions. The ‘Soh Sau’ action (more commonly known in Wing Chun circles as ‘Gum Sau’) is an effective defensive action for controlling kicking attacks at both long and short range. As is the case with all Wing Chun actions, it employs deflection as opposed to “hard” blocking and is a multi-purpose action that can be used for more than one application. In the ‘Wong Shun Leung Method’ of Wing Chun, the term ‘Soh Sau’ (“pressing hand”) is the name given to this technique as the late Sifu Wong Shun Leung preferred to use the terminology of the original Fatsaan (Foshan) dialect of his teacher, Grandmaster Yip Man, whereas most others have tended to use the more “Hong Kong-style” Cantonese words ‘Gum Sau’ when referring to it. This technique is most commonly applied against front kicks, but can be modified to deflect roundhouse and side kicks as well. As Wing Chun is predominantly a close range, hand orientated system, practitioners of the system prefer to get in close and stay there, but of course many martial arts employ front kicks as a chief means of keeping their opponent at bay, thus there needs to be an effective method of getting past such an attack with the minimum of effort. The ‘Soh Sau’ action provides a simple way of doing just that. 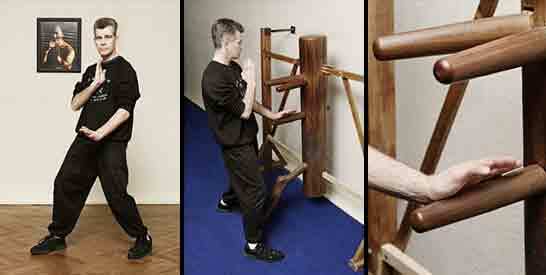 Introduced in Wing Chun’s ‘Siu Nim Tau’ (“young idea”) form as a stationary hand action to the front, side and rear of the body, the ‘Soh Sau’ technique is further explored in the ‘Cham Kiu’ (“bridge seeking”) form and the ‘Muk Yan Jong’ (“wooden dummy”). It can be trained in isolation or within various partner drills, including of course the contact reflex exercise of ‘Chi Sau’ (Wing Chun’s unique “sticking hands” drill) so that it becomes a natural response to leg attacks. In addition to the obvious use, ‘Soh Sau’ can also be utilised to prevent or break free from arm locks, and can be used as part of a simple response to breaking free of rear bear hug attacks. In Wing Chun, techniques are always considered as “verbs” and not “nouns”, thus ‘Soh Sau’ is an action and not a position and this is what leads to its versatility. In short, it represents a concept, not a fixed movement, and as a concept can be applied in many useful ways. 1 David demonstrates the soh-sau technique as its done in the Wong Shun Leung Wing Chun system. When in a long-range position, the ‘Soh Sau’ action is used to deflect the attacking leg by deflecting it off line anywhere between the knee and the foot itself, depending on the distance from the attacker. Preferably, it is applied to the outside of the kicking leg, but can also be used to the inside so long as aggressive hand attacks follow the defensive action to ensure that recovery by the attacker cannot proceed. At close range (within arms reach), the ‘Soh Sau’ action shuts down the attacker’s ability to kick by actually controlling the arms, rather than trying to deflect the leg itself. Through ‘Chi Sau’ training, one can learn to feel the opponent’s attempt to kick. This is because in order to kick, weight transference and shifts in the body’s position can be felt through the arms. By then pressing into their adversary’s arm position, the hips and balance are affected such that the kicking action cannot be performed effectively. Rather than meeting the kick head-on and thus risking injury to the defensive hand/arm or the possibility of the kick still getting through, the ‘Soh Sau’ action is always done in conjunction with a shift of the body such that the Wing Chun exponent is left facing the attacker from a safer and more offensively favourable angle, whereas the attacker is left off balance and facing away from their intended victim. With this in mind, it is important to add that whenever ‘Soh Sau’ is used to control kicks, the hand that performs the deflection MUST be immediately brought back towards the enemy because it represents the closest available defensive tool against his/her nearest next-best weapon. As a means to break free of arm locks or attempted arm locks, the ‘Soh Sau’ action is done such that non-resistance is applied, such that the palm is driven downwards close to the body, assisted by footwork in the direction of the attacker. The nature of the movement is such that the grip is weakened and the shoulder of the defender can be used as the primary weapon, catching the attacker off balance and in a poor position for recovery or defence. In the case of rear bear hugs, the action is done to the rear with one or both hands, again in conjunction with footwork towards the attacker, thus keeping them off balance. The initial raising of the elbows helps to weaken the grip, while the presence of one or both hands near the groin area typically causes the opponent to pull away, even if a groin strike is not made, thus further weakening the structure and making escape easier. From there, it is then possible to break free, or else regain a frontal position and counter attack. A throw is also a possibility. 1 David engages his opponent’s hand and, sensing a shift in balance. 2 . he uses soh-sau to press on the leading arm, nullifying the attack. 3 . and following up with his opponent is off balance. It is important that the palm is utilised as the instrument of deflection when using ‘Soh Sau’ to guard against kicks. The elbow needs to be kept close to the body for structural support and the hand kept relaxed. Locking hand, wrist and/or elbow will only send the shock wave up the arm, potentially leading to serious injury. By quite literally tapping/slapping the offending leg away, there is a lesser collision of forces and deflection occurs more naturally. The target will be determined by both the height of the kick, as well as ones distance from the opponent. If the kick is aimed high and at more-or-less full extension, contact will likely be made along the side of the calf, at the ankle or the foot itself. Should one be closer to the attacker, or shift effectively to the side while executing the technique, contact will be more likely to occur around the knee area. Applying ‘Soh Sau’ to break free of an arm lock requires one to press downwards towards the ground, therefore there is no specific target as such. Instead, attention needs to be given to keeping the arm relatively close to the body as extending it too far forwards makes it possible for the enemy to retain control. When being applied to break free of a rear bear hug, the target is either the groin or the top of the thigh. If the groin strike is achieved with the palm, it can be easily converted to a grab if necessary to effect further compliance from the enemy. At closer range against kicks, the palm is used to press down upon the arms in such a way as to effect the adversary’s centre of balance. Thus the palm is directed slightly across the body and towards them, not straight down. 3 … and following up immediately, catching his opponent out of position. To defend against kicks at long range, ideally the body should pivot or shift to the outside of the kicking leg, thus taking us off the direct line of the attack. At the same time, the hand on the side angling away slaps diagonally downwards, intercepting the kick and deflecting it towards the opposite side. Throughout this action, the other hand is kept in front of the chest to act as a backup defensive position should the opponent attempt to attack with the hands. The ‘Soh Sau’ hand should then immediately return to the centre to guard against the nearest threat which will always be the hand closest to that side (ie: if you have deflected his/her right leg on the outside, the right hand is the nearest threat; if you have deflected the right leg on the inside, the left hand is the nearest threat). At close contact range, having detected a shift in the opponent’s balance indicating the leg is being raised, the most effective response is to pivot and press downwards & forwards with one hand upon his/her arm. Once again, the rear arm remains high and can immediately initiate a strike, capturing the opponent twisted out of position and off balance. This action works effectively at close contact range regardless if the attacking leg is the right or left one. 3 … enabling David to then move in and attack. ‘Soh Sau’ is best trained by practising the three forms mentioned earlier, as both structure and application are developed under ideal conditions, from basic to more advanced in nature. Partner drills, especially ‘Chi Sau’ training, provide the next best way to develop the ability to apply the technique naturally under pressure. The training partner can attempt to use kicks at various stages and ranges within the ‘Chi Sau’ drill, thus testing one’s ability to react both by touch reflex (at close-contact range) and by visual response when attacks occur from further away. 1 During chi-sau, David’s partner attempts to kick. 3 … enabling David to step further in and attack. As a matter of fact I have not observed quite the same technique/concept being applied in any other major martial art systems. Having said that, Bruce Lee utilised a variation of the ‘Soh Sau’ action in his own JKD method. Generally, I have observed that in most other fighting arts, kicks tend to be deflected or blocked with the limb on the near side of the attack, whereas ‘Soh Sau’ is done with the opposite hand. How does David use it? I have a preference for controlling the kicking range of my opponents by using footwork to get in close and jam them up, so I haven’t used this technique very often under combat situations per se. Having said that, there have been occasions when timing has been less than perfect, or distance mismanaged, and ‘Soh Sau’ has been extremely effective at those times to deflect kicks. When engaged in ‘Chi Sau’ practise however, there have been innumerable times when I have been able to shut down attempts to kick by utilising this technique at close quarters, as well as using it to avoid having my arm locked-up or grabbed. It is quite amazing how adaptable this concept is and how easily it lends itself to a variety of situations with subtle modification, such as using it in conjunction with side-stepping to push off an attempt to shoot at my lower body by a grappling attack. The possibilities are quite endless!